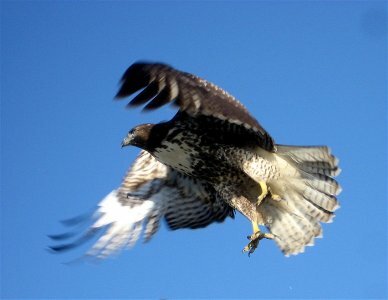 Red-Tail Hawk, Buteo jamaicensis, flying high. Here you can see where the wind-swept Scruffy gets her name. lurking nearby with a pocket cam. That was pictures of two of them (or is it the same? ), but still don't know which species it is? and the Lesser Antilles but not the Bahamas or Cuba. B. j. borealis breeds from southeast Canada and Maine south through eastern Texas and east to northern Florida. It winters from southern Ontario east to southern Maine and south to the Gulf coast and Florida. southwestern British Columbia southwest to Guatemala and northern Nicaragua. Paler individuals of northern Mexico may lack the dark wing marking. wing linings and sides, and some birds have rufous underparts. The chest is much less heavily streaked than in northern migrants (B. j. calurus) to Central America. B. j. fuertesi breeds from northern Chihuahua to southern Texas. It winters in Arizona, New Mexico, and southern Louisiana. The belly is unstreaked or only lightly streaked, and the tail is pale. streaked, mottled, or barred. Shorter primaries result in wingtips that don't reach the tail in perched birds. It breeds in Alaska and northwestern Canada and winters from Nebraska and Kansas to Texas and northern Louisiana. This population may well be a separate species. B. j. kemsiesi is a dark subspecies resident from Chiapas to Nicaragua. The dark wing marking may not be distinct in paler birds. B. j. kriderii is paler than other Red-tails, especially on the head; the tail may be pinkish or white. and extreme western Ontario south to south-central Montana, Wyoming, western Nebraska, and western Minnesota. In winter, it occurs from South Dakota and southern Minnesota south to Arizona, New Mexico, Texas and Louisiana. 6.] 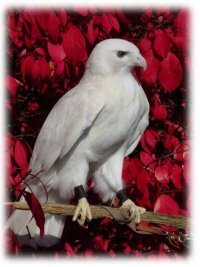 Tesky, Julie L.. "Buteo jamaicensis". U.S. Department of Agriculture. http://www.fs.fed.us/database/feis/animals/bird/buja/all.html#DISTRIBUTION%20AND%20OCCURRENCE. Retrieved June 10, 2007. 7.] Howell, Steve N. G.;Sophie Webb (1995). A Guide to the Birds of Mexico and Northern Central America. Oxford University Press. ISBN 0-19-854012-4. 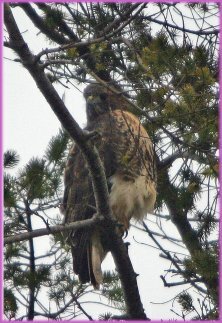 There are up to 16 subspecies (some put it at 7 with a variety of races) of Red-Tails in North America. There are different colorations, or morphs, adding variety within each subspecies. 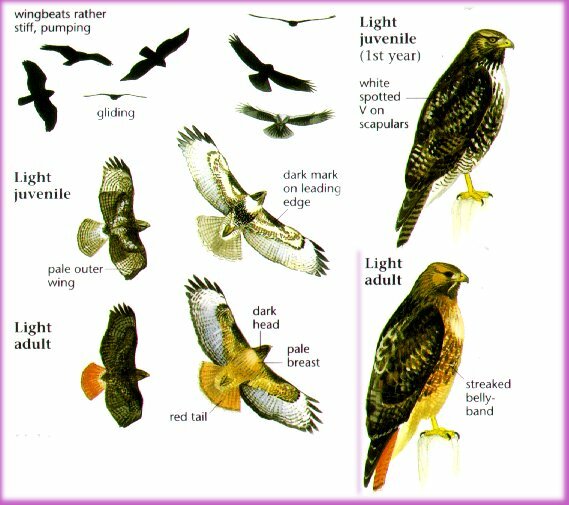 The darkest subspecies is called the Harlan's Hawk (Buteo jamaicensis harlani). 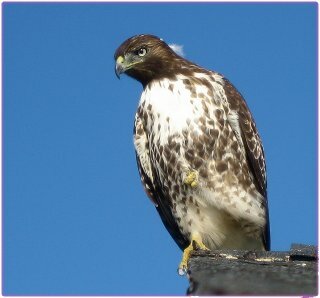 The lightest subspecies is called the Krider's Hawk (Buteo jamaicensis kriderii). and Grennell (Buteo jamaicensis alascensis). Most all of these birds display a dark patagial mark which is a dark patch in the "underarms". and there are albino (pure white with red or pink eyes) and leucistic (pure white with blue eyes) colorations as well. So, its as easy as that. Or - which one is it? Photo courtesy of Eileen Wicker of Raptor Rehabilitation of Kentucky Inc.
Life goes still on, but if or when we learn more, we will be back.